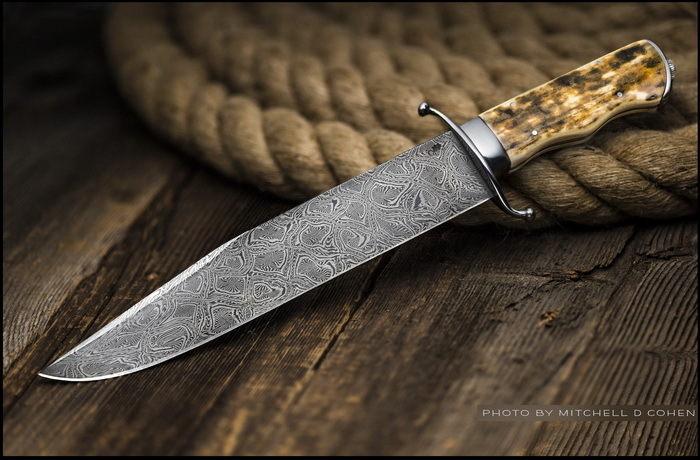 Gary Mukey has forged a stunning Mosaic Damascus Bowie with a 11-inch blade, elegant S-guard and exhibition grade Mammoth Ivory handle scales. 16.5 inches overall length. Gary Mukley has been a full-time knifemaker since 1997, though he made his first knife over 40 years ago while an apprentise blacksmith. He currently maintains a knife shop in Branson, Mo. located at The Shepherd of the Hills Farm. He is normally there Monday thru Saturday from late April until Christmas where you can watch him build one-of-a-kind custom knives. He continues to build knives year around at his home shop.